With a faery hand in hand …. " Welcome to the magic of Dingle, to our fourth sacred journey to The Dingle Diamond Temple Landscape in the South West of Ireland. The inspiration for this year’s journey came close to the birth of B116, Queen Mab. The call of the nature spirits to this area is not surprising. It was here, about 5,000 years ago, the Tuatha De Danann (the people of the Goddess Dana or mythical fairy people of Ireland) built a great temple of the sun. The temple is comprised of many sacred sites, each aligned with the solar events of the year (equinoxes & solstices) as well as the 13 lunar months of the year. The World of Faery is intrinsic to this area. A fitting place to welcome Queen Mab. Also, intrinsic to this area is the Michelic energy. Just off the coast of Dingle is Skellig Michael, an important energy point on the “Michael Line”. From here it enters Ireland, crosses through Europe and continues on to the Middle East. The majestic, serrated, rocky island is a Great Light Presence for any journey on the Dingle Peninsula … for any journey into the “temple”. In Aura-Soma® we talk about the Angelic – Human – Devic connection. How lovely it would be if you, dear human, could join us on this sacred journey, in the company of Queen Mab and the overlighting Angelic Presence of Angel Michael. Another synchronous aspect of this journey is that the 25th July is the Day Out of Time, traditionally related to the day of conjunction with the sun with Sirius Rising. It’s seven years since 2012, prompting great celebration and ritual in the Mayan worlds, as cycles end and new ones open. What a delight that Aura Soma will celebrate “Time is Art” in beautiful Dingle. With much love, we invite you to the beauty, the light and the grace of our sacred journey in Dingle at this auspicious time. Cost for the course: Early bird €830 before 30 April 2019. Full price €940. It includes Mike’s teaching, local coach travel and lunch each day. Deposit: €100 on booking (payment to Cathleen Morley). In Dingle July is holiday season and prices are higher. Accommodation offered is bed and breakfast. €90 per person sharing per night. This is simpler accommodation. It is being redecorated. There is a range of Bed and Breakfast accommodation in Dingle. Websites like booking.com can be used for booking and will have information on availability and price. The Hideout: €40 per person per night for twin room, en-suite. Royal Blue invites us to see ourselves more clearly, and rather than focusing on the external projections of ourselves, it supports us to look within. 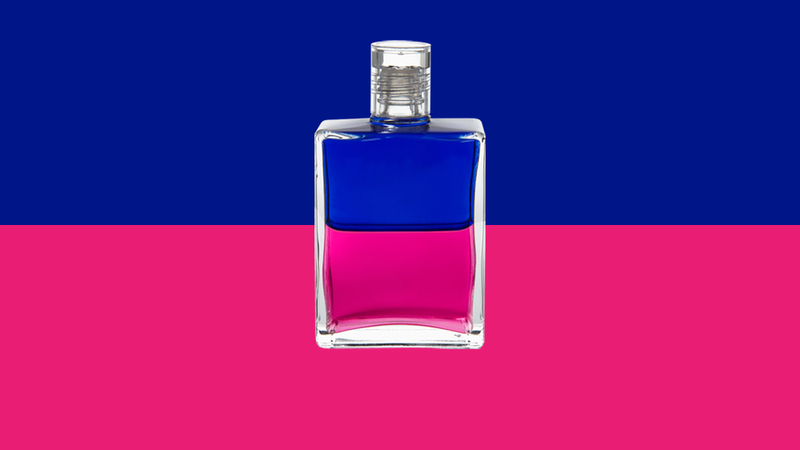 As the Royal Blue is now linked in this bottle with the Magenta in its bright form, not Deep Magenta as in B0, it is also encouraging us to look without judgement at what we see in ourselves. This bottle marks a very significant shift in relation to the system of Aura-Soma. To me it’s really part of the new beginnings of what Beyond Colour has been all about. It gives us the indication that really Aura-Soma is for those who wish to re-member themselves, to pull together the parts to be able to be in the position to bring the different aspects of our being together. Putting less emphasis on what we think about things or how it is we feel and to perceive those aspects of our being as the passing clouds behind the clear blue sky of mind. The crystal clarity of the mind itself in terms of the night sky is reflected in the conscious level of this bottle, the upper fraction. The unconscious/subconscious aspect, the Magenta shows us how important it is that we put our caring, our warmth, our love in to the little things, how it is that we begin to manifest that compassion towards ourselves with others how it is that we might find the way to overcome our differences. The Magenta supports the possibility of integration within ourselves, the integration of the discrepancies of the inner conflicts which we inevitably see as we begin to penetrate deeper into looking in to ourselves at the deeper levels of ourselves. The birthing process in terms of my awareness came prior to December 14th, became actualised on December 14th and has continued to grow until it is that this birth has taken place. Queen Mab is the Queen of the Fairies. Queen Mab has appeared in many different theological and artistic works, she is referred to by Shakespeare in ‘Romeo & Juliet’ and frequently in Irish lore under the name of Mab along with, Maebh, Medb and Maeve. Medb is known as a Celtic Sovereignty Goddess of War and Fertility. In many texts she is referred to as having sexual prowess and dominance. Percy Bysshe Shelley wrote an epic moral poem called ‘Queen Mab’ in which he refers to her as ‘Queen of Spells’. Here is thy fitting temple. Less shares thy eternal breath. Percy Bysshe Shelley was recognised as being unconventional, an idealist and an avid vegetarian. He thought of vegetarianism as a way of life, a way of putting the care in the little things, he recognised the discrepancy between loving animals and eating them, he challenged convention. Shelley’s view was not only a political gesture, it was also socioeconomic and to do with the being of the earth, his love of nature, his love of animals and how he found the conventional forms of relationship something which were very difficult to adhere to. In other words the love, like that which is in the base of the bottle, and what it is that we’re asked to look at within ourselves is beyond convention. The numbering is very significant with this particular bottle, we know the whole of the system of Aura-Soma comes to be an 8, the whole of the numerological significance of the letters Aura-Soma are a 26/8. With the 116 we’ve got an 8. When we look at the numbers of the time of the birth then 14/1/2019 > 9, the way that could be seen is an 18/9. That feels to me very appropriate because the Physical Rescue with the 8 is almost like a supportive energy for what is contained within the 8. When we look at the significance of that 8 appearing then we’ve also got to look at the Spiritual Rescue, the 0 and we’ve also got to look at the 20, the Child Rescue or the New Aeon Rescue or the Star Child, the B20 shows itself in a deeper form, kind of in between the 0 and the 20. In that sense the 8 relationship with the beginning bottle of the sequence, the 0, then the 2 with the 0 as being something that is also encompassing that spiritual rescue quality because of the 0 with the 2. When we look at the 8 as the bottle in between (in terms of the colour gradation) the lighter version of the 0 and the deeper version of the 20 so it is then that we’re looking at something very profound of how it might also be a deeper level of spiritual rescue and the inner journey of perhaps that part of ourselves that stands at the edge of the cliff with all of the potential of what can be in relation to the elements and yet we need to learn and to understand how it is that through getting in touch with the elements we can work with them in cooperation with nature spirits, with the energy of Queen Mab as a kind of number 2 energy, a kind of High Priestess energy, she’s also part of the spirit of nature herself, like Shekinah. Shekinah as the female aspect Kabbalahisitically hidden in nature. The birth of Queen Mab falls between two eclipses making this a very poignant time for the birth of a new bottle. The partial solar eclipse on January 5th signifies that many possibilities are available and we can start afresh, cleansing old behaviour patterns in order that we are able to make progress.